Prevedere uses the latest in cloud computing and predictive analytics to make it easy to determine your company's future performance. 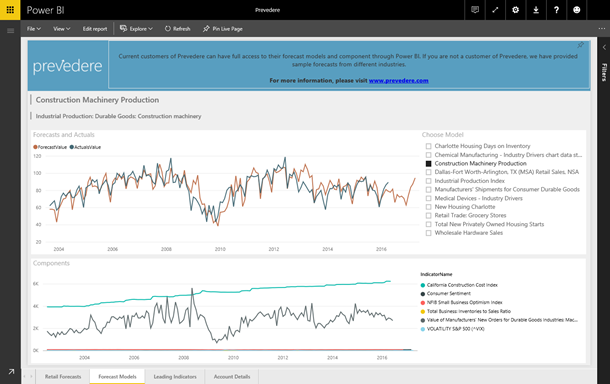 With the Prevedere content pack for Power BI, you can visualize and explore your predictive results. This out-of-the-box solution includes information such as financial forecasts, top growth markets, and global economic, industry specific, and weather data that's relevant to your business. The interactive reports allow you to easily explore the key external factors that impact your business in ways key decision makers can and want to consume. This post will explain how the Power BI content pack can help you analyze your Prevedere data. 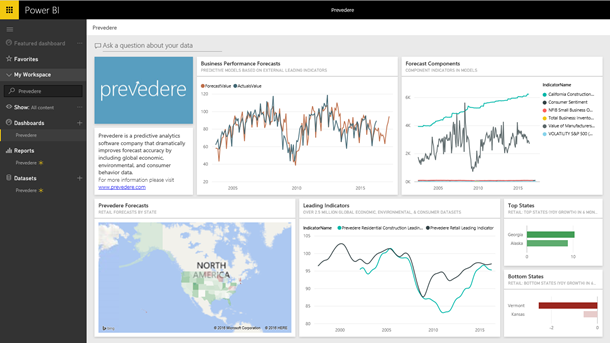 For additional details on how to get started, please see the Prevedere content pack for Power BI help page. Connect to the content pack with your Prevedere credentials or the sample ones provided. Once the connection is complete, Power BI will automatically create an out-of-the-box dashboard, report, and dataset. Selecting the dashboard shows an overview of the insights included in the content pack. Hover over the visualizations for more details, or select Focus mode to expand the visual into a full-screen view. You can select any of the tiles to drill into the multiple pages of reports behind the dashboard, such as selecting the Business Performance Forecasts tile to view the Forecast Model report. Use the slicer on the right hand side to focus the page to a particular model. You can also switch to Edit mode to customize reports by changing or adding visuals. All of the tables and fields available in the content pack are listed in the Fields pane, and selecting any visual will show the fields used for that metric. From any of the reports you can pin the visuals or tiles to the dashboard by hovering over them and selecting the pin icon. You can customize existing dashboards by pinning content from multiple reports all onto a single view. The dashboard and reports continue to update daily using a default scheduled refresh that you can configure on the dataset. 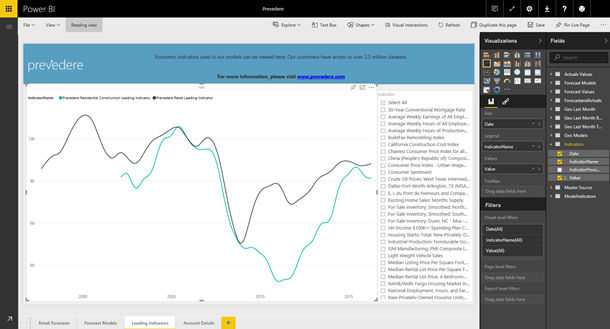 The Prevedere content pack for Power BI offers an overview of important insights, allowing you to explore your predictive results even further. We’re always interested in hearing your feedback! Please contact us at http://support.powerbi.com to let the team know about your experience and if there’s anything we can do better. We look forward to your feedback!